This scale model of Envisat shows the relative size of the craft that now poses a threat to other orbiting satellites (Credits: ESA). An advanced remote sensing satellite designed to provide accurate data on the Earth environment, Envisat leaves the space community after 10 years of stunning images and continuous measurements that made possible more than 2500 scientific publications. 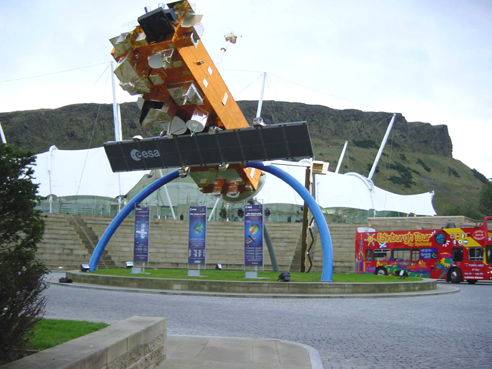 Launched by the European Space Agency in 2002 to ensure the continuity of data measurements with the European Remote Sensing Satellites ERS-1 and 2, the satellite abruptly stopped communicating last April, soon after its 10th birthday. However, the natural “death” of Envisat, with its 8 tons weight and the size of a schoolbus, does not only mean the loss of a useful tool for measurements, that will have to be soon replaced by the Sentinels of GMES, but also the birth of a new massive “space debris” and the consequent growth of the population of “space junk” polluting Low Earth Orbits. Destined to remain in a very populated orbit for about 150 years, posing repeated conjunction and collision hazards to other spacecrafts, the Envisat case triggers a series of legal and political issues and is particularly interesting from a Space Law point of view, as the latter is called to provide unambiguous solutions to a problem that seems to be more and more pressing. While the debris population grows and the “Kessler syndrome” depicts scenarios that will inevitably push towards a more “sustainable” use of space, a binding legal framework for debris mitigation is indeed still lacking. The adoption of collision avoidance maneuvers or end-of-life measures are until now not imposed by any binding Treaty and are accordingly left to the goodwill of States. In such a context, and especially since such maneuvers require fuel, thus reducing the lifespan of space objects and causing add-up expenditure, the right to access space itself for all spacefaring countries results as unsecured. Several are the juridical issues that need to be promptly clarified: while a commonly agreed definition of what is a “space debris” should be a primeval step, a clear and binding legal framework on debris mitigation and the clear identification of liabilities in case of collision or damage has to be put in place. However, although none of the existing Space Treaties contains any explicit provisions on the issue, it is to be noted that several general obligations are already in place under the 1967 Outer Space Treaty and the 1972 Liability convention, while general international law already sets out a general principle of neminem laedere, recalled in several ICJ cases and widely considered as customary. Yet, general principles and mitigation “guidelines”, essentially voluntary, proved to be not enough to ensure proper conduct in the medium and long term. Envisat marks a turning point in space debris management: faced with a quantity of space debris that poses a constant and significant threat to space navigation, the permanence in a logic of voluntary practice and goodwill actions is no longer allowed, as the primary freedom of all countries to access space is at stake. All spacefaring nations have contributed to the pollution of the space environment and all of them should as soon engage consultations in order to avoid collisions and ensure debris mitigation initiatives, but also to support and boost the programs for debris “active” removal, otherwise not always economically viable. In order to guarantee a clear identification of the liable state, the general obligations under Article VII of the Outer Space Treaty and the Liability Convention should be unambiguously defined when dealing with space debris. Although it is clearly stated that the “launching State” will be financially liable in case of damage, the primary definition of manmade debris as space objects under Article 1 of the Liability Convention should be the first step of a process that should lead to a widely ratified treaty on “space debris liability,” much stronger than a code of conduct, and as binding as the Treaties that set the general framework of Space Law during the cold war. While in the present situation the “launching States” can still play on the absence of specific norms and the persistence of grey areas, this cannot be acceptable in the view of an urgent need to impose a conduct that can effectively reduce the risk that, in a few decades, the space era itself might finally come to an end. Above all, principle 21 of the Stockholm declaration on human environment that imposes to not cause damage to “areas beyond the limits of natural jurisdiction”. Rosa Rosanelli is a graduate student of Master 2 Space Law and Telecommunications, Paris Sud University. She gained significant experience in the field of juridical, political, and strategic aspects of space activities within the framework of the Istituto Affari Internazionali-Finmeccanica scholarship and internships at the European Space Policy Institute in Vienna, and at the Export Control Department of Thales. Her research activities cover topics such as security and defence, European policy, telecommunications regulation, and export control. She is responsible for leading the research group on Defence & Aerospace for the International Security Observer. Rosa holds a Masters in International Relations from La Sapienza University of Rome. She speaks Italian, English, French, Russian and German. Excellent contribution to the site! Welcome to the Space Safety Magazine team Rosa! Dr. Doldirina and I have debated whether there is a legal definition of space debris. I am not a lawyer (but I am an Associate of the American Bar Association). I am a principal in the International Standards Organization, convenor of the Space Operations and Ground Support Working Group. ISO Standard 24113 includes a normative, legally enforceable definition of space debris. There are several standards for specific operational and debris mitigation measures based on this definition. NASA, ESA, JAXA, and others amplify and expand such measures in widely applied institutional standards and regulations. The issue is how to develop liability guidelines that recognize the fundamental uncertainty of space operations. How can one discriminate intentional and malicious acts from unavoidable behaviors in a very poorly characterized environment? This is one of the elements of a forthcoming IAC paper by Dr. Doldirina, dr. Howard, and me.